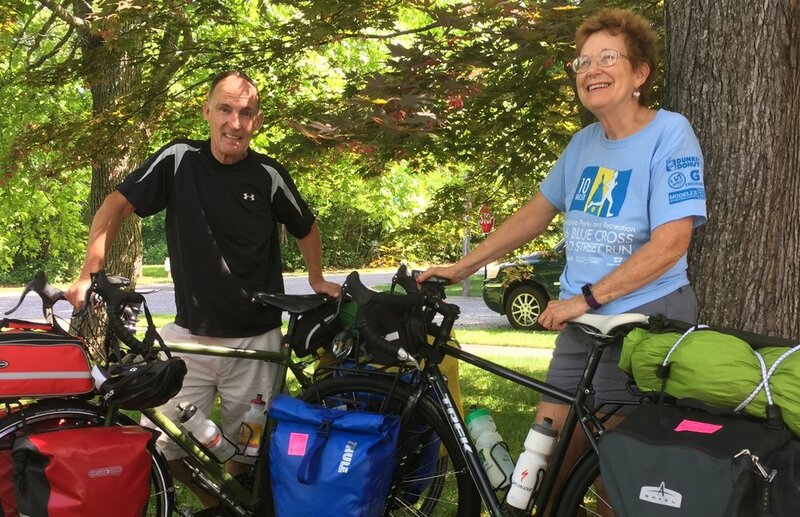 The Plan: Dave and Deb (siblings) will be bike/camping from Cape May, Nj to Quebec City, Quebec, Canada and back to Cape May. The time table: Leave yesterday boarding the Cape May/Lewes Ferry and heading north through Deleware with a nice southerly tailwind at our backs. Ahhh...we have 30 days to play with. Change of plans: A bike part has yet to arrive, so we are waiting. FedEx will be here today. Dave, being the expert biker and camper has given me much appreciated packing advice. We have done a trip like this before (10 days). On that trip I had a different bike with less room for panniers (gear bags). So now I have twice as much room, but that can translate to twice as much weight., which can translate to twice as much poundage to move with the same 2 legs. Purging: Trying to lighten the load BEFORE we leave, Dave nixed-- 2 apples, 4 tangerines, granola for 6 days, half the snacks, and alas! prepped salad dressing (delicious on everything! ), and oil and vinegar to make more dressing, one pan and my favorite pink shoes. I refused to give up the nail polish kit--some things HAVE to go along. Dave has perfected THE LIST over the thousands of miles he has ridden. With list in hand, it has taken me 4 days to pack and repack and repack again, STUFFING my version of this list into 4 panniers. Comes down to taking absolutely only what is necessary-- hot weather, cold weather, rain and snow (it can snow in Canada in late May). However, IT WILL NOT BE RAINING OR SNOWING on this trip.